Last year, while making a sad attempt at NaNoWriMo with a couple of my writer friends, I discovered PiBoIdMo, which asks you to think of 30 picture book ideas in 30 days. I’ll be honest, this is a much better fit for me than NaNoWriMo. 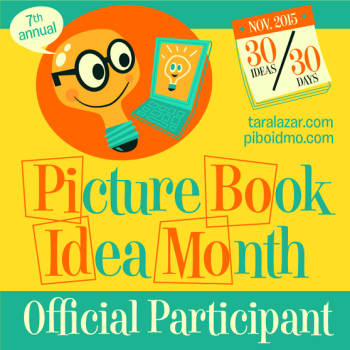 PiBoIdMo was created by Tara Lazar as the alternative to NaNoWriMo for picture book authors. Last year, I stumbled upon Tara’s website a little too late in the month to be a participant, but I did enjoy making my very first list of ideas. This year, I’m excited to be joining in on the fun for the entire month, and maybe I’ll be lucky enough to win one of the dreamy prizes (signed books, original art, agent feedback, critiques and more)! During PiBoIdMo, Tara’s website will also feature guest posts by authors, illustrators and industry insiders. If you have any interest in writing picture books for kids, you should check it out. It’s a fantastic way to get the creative juices flowing. Here is the link to this year’s registration information: PiBoIdMo 2015 Registration is Open! One way to make the cover of a picture book capture the interest of potential readers is to make it naturally invoke questions. Questions like, “Why does that backyard pond have sharks and squid in it?” and “What are the boy and the dog at the edge of the pond going to do?” These are the questions that pop into my mind when glancing at the cover of Beyond the Pond by Joseph Kuefler. For young Ernest D., life is ordinary and boring, so he decides to explore the pond in the backyard. After poking it with a stick, using a fishing pole to dip down into it and throwing a stone, he discovers that the pond is bottomless. Excited to explore a pond with no bottom, Ernest D. drags out all of his explorer gear, prepares himself and dives in, with his dog, to uncover the mysteries of the pond. After the fish and the frogs come the sharks and squid, sunken treasure and darkness. When Ernest D. and his companion come up on the other side, they discover a world that is wondrous and magical, but also frightening and beyond imagination. Ernest D. is a brave young boy who battles his way through the scary monsters of this strange, wild world. Satisfied that he has found something “exceptional,” he travels back through the dark pond and emerges back home with a new perspective. His own ordinary world becomes extraordinary. The illustrations for Beyond the Pond are pretty magical. I’m especially fond of the spread where Ernest D. and his pup sit in a tree watching the sun rise in a land where dinosaurs roam in the distance and purple butterflies float against a backdrop of rainbow-kissed mountains. The story, not just the cover, may lead to a lot of questions, especially from younger children. I found myself asking why the dog doesn’t wear diving gear like the boy, and you may find yourself explaining the meaning of the words exceptional and ordinary. You might also find yourself reassuring sensitive kids that sharks don’t actually live in ponds. As a kid, my imagination used to run wild while swimming in our local lake and even our pool. Sharks would pop into my mind often when I closed my eyes to go underwater. And I didn’t even need a book to suggest this. Imagination is a funny thing – it can be both frightening and inspiring. Beyond the Pond is a great story for starting a discussion about what’s real, what’s fiction and how imagination can change the world. What’s your favorite book about the power of imagination? Let me know in the comments section. The bright autumn leaves on the cover of Ask Me by Bernard Waber drew me right in. It’s a beautiful time of the year, even if it is turning colder. The color is starting to pop all over the Northeast. It’s the perfect time for leaf peeping and curling up on the couch with your favorite kid to read fall-themed books. Written entirely as a dialogue between a young girl and her father, Ask Me paints a gentle portrait of an energetic child exploring her own sense of self and the relationship she has with her father who patiently plays her game, giving her the space to verbalize her every like and love in the world. When the girl says she likes geese, the father simply asks, “Geese in the sky? Or geese in the water?” I am partial to this passage because, like the little girl, I am a fan of geese both in the water and when they fly in the sky. Watching geese fly together always gives me a sense of gratitude and a sense of something bigger than me. This book reads like a list of all the great things the little girl loves about the world, and it is clear that her father is one of her favorites (along with ice cream!). There is no attribution to the dialogue, but the father’s words are written in purple to distinguish them from his daughters. It requires you to make voice changes when reading the book aloud. It would be hard to follow the story without them. Suzy Lee’s illustrations match the innocent voice of the child, further bringing you into the world of the girl as she strolls along with her father on a lovely autumn day. It’s likely that any child you read this to will want to tell you about all of the things they love, so be prepared! The Most Magnificent Thing by Ashley Spires is a story of perseverance and a lesson in gaining perspective and understanding difficult emotions. A regular girl, with the help of her best friend, sets out to create the most magnificent thing. She has a vision in her head of what that looks like, but she keeps creating things that just aren’t right. Frustration starts to take hold of her, and it grows into anger. She starts to smash things together trying to make things work, until finally she smashes her finger and explodes with anger, ready to quit. Her faithful companion (yes, a dog), convinces her to take a walk. She starts to cool off, and when she returns to the spot with all of her failed attempts she notices all of the perfect pieces in each failure. So, she gets back to work to create the most magnificent thing. The Most Magnificent Thing was recommended to me because I am a big fan of Rosie Revere, Engineer by Andrea Beaty. (Read my review of that book here.) They certainly have similarities: a girl engineer character and a message of perseverance. Yet, each has its own unique lesson conveyed in the plot. The Most Magnificent Thing features an important modeling of how to calm down when you are angry and not seeing things clearly. It introduces the practical solution of walking away from a frustration for a short period of time to gain perspective on the problem – a solution that many adults fail to recognize and use. Children feel tough emotions, such as anger, but often don’t understand them well enough yet to apply coping mechanisms. Through parental guidance, life experience and reading, children eventually learn how their behaviors play a role in their emotions. Books like The Most Magnificent Thing , which allow a child to put themselves into the shoes of the main character and walk through tough emotions without being wrapped up in them, are excellent tools for developing emotional intelligence. The Most Magnificent Thing is also a visually appealing picture book. The main character, her friend and her inventions are set in bright color against black-and-white line drawings of a city street or sometimes nothing at all. It helps the reader focus on the emotions being felt by the little girl, as well as the comic relief provided by the companion. Do you have a favorite book for teaching emotional coping skills? Is there one book in particular that helped you or helped your child with a difficult emotion? Let’s talk about it in the comments section below.